End of 15 day sketch development course. correct the sketches and submit them asap. Complete your pending assignments that yu have mentioned. implement the feedback nad resubmit your sketches by 26th April. Submit the pending assignmetns. be online tommorow at between 10 to 11 pm. for live interactive sessin. Submit next assignment by 21st April. Complete tthe bottle assignment. i have sent you next one, submit it by 20th April. Submit next asignment as discussed over live interaction session by 19th April. Saaransh!, redo the bottles assignment and leaves 2d composition as per the feedback. For the botles assignment, repliate as you see the bottles in front of you. 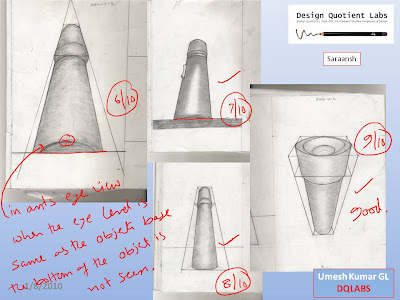 get the correct proportions of the objects. 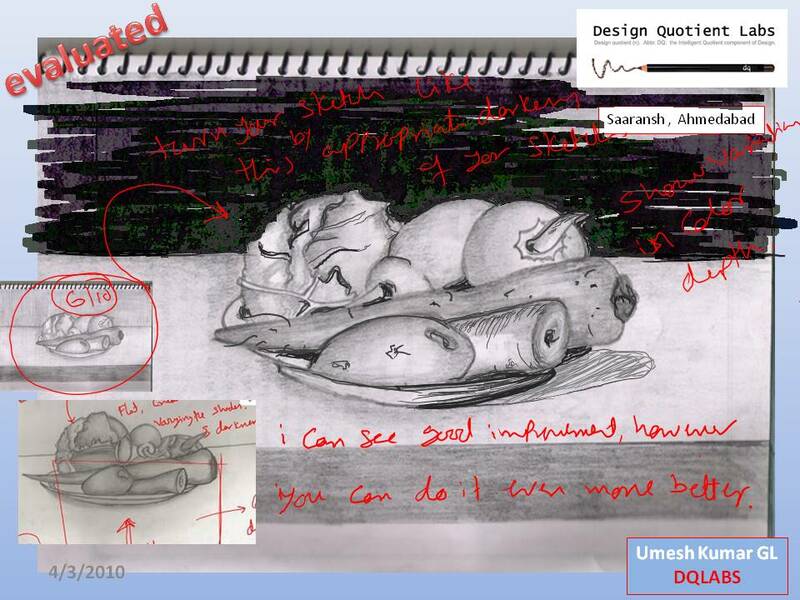 then render the sketch depecting the reflections, refractions and shades / shadows on the objects you will have to improve your observations skills, before you can work on the visalisation and creativity skills. submit the well drawn sketches by 19th April. Follow the feedback and resubmit the images by 14th April. Submit the pending assignments as well the new ones sent by email. Correct the sketches as perthe feedback. for next assignment, create a 3d composition using 2 bisleri bottles and an half filled glass with a spoon in it. also submit the assignments sent by email. submission date - 12th April. Correct your drawing as per the feedback and submit it by end of today 8th April. Create a 3d composition using a mobile phone, tennis ball, cofeemug and a table clock. reder it appropriately. Take this as a test for your rendeirng skills you have learnt so far and d oa good job. submit it by 7th of April. 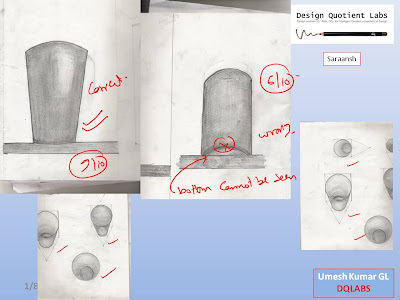 Submit he sketches as per the feedback given on previous sketch by 6th of April. Hi saaransh, you have made good progress in your shading assignment, however i want ot see some aspects of it to be mastered. as in the below sketch, you can see what level you can take your sketches to by adding few simple dark values at approprite areas. Let me know if you want to go into that direction in shading / rendering or go to the next topic. accordingly i will guide you. Update your sketches as per thefeedback. 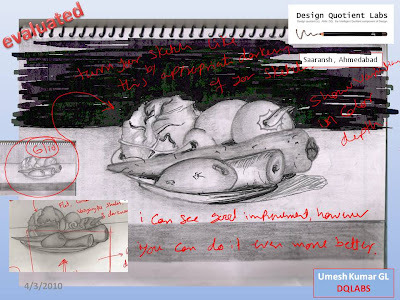 also re render the vegetable still life you have drawn before. use the light and shade concepts you have learnt while re rendering it. Submit the sketches by 5th of April. foolow the feedback and update your drawings. submit them by 5th April. Do the corrections and submit all hte pending assignments. also i have included 2 jpegs below. create shades and shadows asper the light position and submit them by 29th MArch. correct the images as per the feedback and submit them by 27th March. Lets fix your undersrtanding of light, shades and shadows. 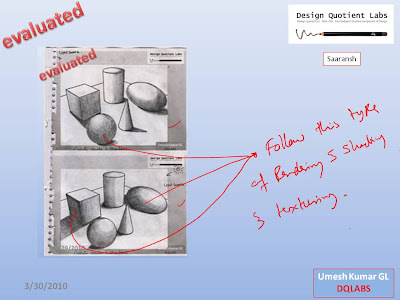 implement the feedback, correct your sketches and draw new ones as indicated below. submit the sketches by 29th MArch. draw any 5 objects used in keitchen in birds eye view and ants eye niew. use the perspective concepts you have learnt before . Submit them by 25th MArch. Submit the pending assignments. Including your understanding of each of the criterea, after studying through students drawings. Submit them by 24th MArch. 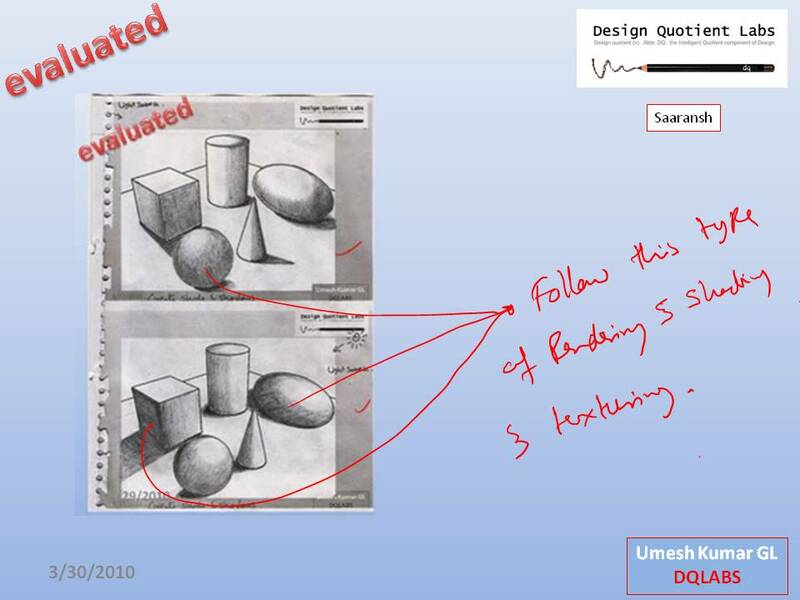 Submit the pending assignments by 11th jan 2010.
correct/redo the sketches as per the given feedback. I have sent you 6 assignments by email. Submit them on 1st Jan 2010. you will get feedback by 4th Jan 2010.There are year end vacation for dqlabbs from 21st dec to 31st decemeber. you will get feedback of your sketches on 4th of Jan.
Can you redo the 3 sketches as per the feedback and submit them by 4th Dec?. if you have any doubts, write them down in the comments section. I woyld like to have a confernce on skype regarding the bottles assingment b/w 11-12 am.